“Music just helps everything, doesn’t it?” Why yes Hayley Williams, it does. I finally got the chance to see Paramore last Sunday, and it just made me adore them even more. Whenever I tell people I’m a Paramore fan, they look at me a bit weirdly. Seeing as the rest of my music taste mostly consists of pop such as One Direction, Taylor Swift and Olly Murs, people seem to be baffled when I tell them I very much enjoy a bit of alternative pop-punk. Or whatever genre you’d classify Paramore as. The truth is my music taste is a little random, but I’ve loved Paramore for getting on for ten years now, and I was incredibly excited to be seeing them live after all that time. After my friend and I had enjoyed some delicious food at Las Iganas (highly recommend) and some cheeky 2 for 1 cocktails (it would be rude not to), we headed literally across the road to the arena. We missed about half of the support act’s set by the time we found our seats, but to be honest I’d have preferred to have missed it all. Damn that sounded harsher than it did in my head. But they were more rock-y type music and it just sounded like shouting to me. I apologise. We were seated in block 13, in the second row of our block which was amazing because although we were towards the back of the arena, we had such a clear view. And for the first time in a very long time I didn’t have the short person problem of having to stand on my tiptoes and peek in between stupidly tall people to be able to see one of the band member’s arms. I could actually see everything that was going on on the stage without having to do anything but stand there enjoying myself. Amazing. Paramore also shocked me – in a good way – by coming on stage five minutes early. They opened with ‘Hard Times’, the first single from their most recent album ‘After Laughter’. I thought this was a really great song to open with because it’s so uplifting and energetic and really got the whole crowd hyped up from the word go. What struck me right from the start and throughout the show was how passionate the fans were and how enthusiastic the crowd was. The whole floor below us was standing and watching them all jump around waving their arms in the air made me very happy – that’s exactly what concerts should be about. From the upbeat ‘Hard Times’ they went straight into ‘Ignorance’, from what is probably my favourite album of theirs ‘Brand New Eyes’, and then ‘Still Into You’, another energetic song that we were all dancing our hearts out along to. These three songs together really made for such a fun and upbeat atmosphere right from the very beginning which I loved. What absolutely amazed me was Hayley’s ability to hit every single note while dancing around all over the place. Honestly, watching her made me smile so much because she was just giving the performance her all – she was throwing all kinds of shapes all over the stage, bending down to sing to and interact with the crowd, just generally having the time of her life while still belting out the songs with her incredible vocals. I truly don’t know how she does it, but it is an awe-inspiring thing to witness. When she spoke, she was equally as endearing. I lost count of the amount of times she thanked us all for our support and you could tell that she genuinely meant it, she struck me as such a humble person and it made me adore her all the more. A few things she said really stuck with me – one being the quote that I opened this post with – and towards the beginning of the show she said “tonight we aren’t gonna worry about anything”, saying that the arena was a safe space for us all to enjoy our little ‘concert bubble’ where nothing else mattered. I think a genuine massive grin emerged on my face as she said that. That’s literally the reason why I love concerts so much, and why I am willing to spend probably half of my life savings to attend as many as I can. They are my escape from the world, where I can spend a few hours not having to worry about anything else but enjoying myself and losing myself in the music with people who share the same love as me. To hear Hayley say that made me incredibly happy and it stuck with me all evening. I was also very happy that they sang one of my old favourites ‘That’s What You Get’ from their 2007 album ‘Riot!’. This song reminds me of when I would listen to this album on repeat when I was younger because I loved it that much. It also gives me flashbacks to sitting on a coach in Spain on a school trip – it was my first trip anywhere without my parents and that was my first experience of being homesick – and I would listen to Paramore on the coach and it would make me feel a little better. Because as Hayley said, music really does help everything. Also, I believe it was before ‘That’s What You Get’, Hayley made another cute little speech about how they’d been around for a long time and they’d changed a lot since then. She said once again how thankful she was for our support over such a long time, despite how much all of us have changed. The thing that I loved the most, though, was when she said “let’s celebrate how far we’ve come”. I don’t think we do that enough, and I think it’s something I really should do more. We get so caught up in where we should be compared to others at certain points in our life, we are so eager to be perfect that we often forget just how far we’ve come. We should definitely celebrate that more. The majority of the setlist was made up of songs from ‘After Laughter’, which was to be expected as this is their most recent album. I loved that here and there they sang a few older songs, though. A few of my highlights from the newest album were the delightfully retro-sounding ‘Pool’, ‘Caught in the Middle’ and ‘Forgiveness’. Hayley’s energy throughout the show never faltered – in fact she just seemed to get more and more energetic as the show went on, as though the energy of the crowd was being reflected onto her. I also loved the fact that other than the screen with funky coloured effects behind them and a circular array of lights, there was nothing ostentatious about their performance. Just the band, the lights and Hayley, the perfect frontwoman. Their music and her incredible energy and vocals did all the talking, no showing off and no gimmicks. Don’t get me wrong, I do love a certain level of extra at concerts, but for Paramore their music and lyrics are so powerful that they don’t need any of that. Another of my highlights was when they sang ‘Hate to See Your Heart Break’, which was such a beautiful moment and one of those I always love – when everyone gets their lighters out and waves their arms along to the song. It’s such a sweet song, and Hayley dedicated it to everyone who had come with a friend or someone who means a lot to them. Being the massive sap that I am, that made me go all warm and fuzzy inside, and the song really made me smile because you could just feel the love in the room. When they sang ‘Misery Business’, another of my old favourites, for the final part of the song Hayley said she was going to bring two people up on the stage to finish the song off. She chose one girl and one guy to be pulled out of the crowd and it was such an endearing moment because the girl ran onto the stage and into Hayley’s arms and they had the most adorable, longest hug I’ve ever seen. I swear I almost teared up, it was super cute. The two of them had the absolute time of their lives singing the last part of the song and it made me smile so much to watch them jumping around in happiness and disbelief that they were performing with someone they loved so much. 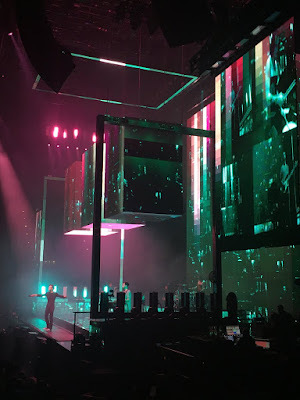 The show finished with the fittingly upbeat ‘Rose-Coloured Boy’ from their newest album, and what was really cool was that they mashed it up in parts with ‘I Wanna Dance With Somebody’, which had the whole crowd dancing and singing along right until the last moment. Even when the band left the stage and the lights came back on, everyone was collectively singing ‘I Wanna Dance With Somebody’ as they left their seats and walked towards the doors. The long wait to see Paramore live was definitely worth it, and I’m so happy they got to be my first concert of 2018. Their energy was amazing, Hayley was so endearing and lovely and her vocals and to be honest everything about her was on point. The show was so lively and fun, I genuinely had the best time I’ve had in a while especially when a week of exams was looming over me it was good to have a break from revision and life in general just for a few hours. I hope you enjoyed this post! Let me know in the comments if you’re a Paramore fan, have you seen them live and what’s your fave song?